WADER is a comprehensive sonar range prediction and Global Ocean Information System which uses Global environmental data (sea state, water column and bathymetry) together with user-supplied acoustic parameters to generate propagation loss data & calculate sonar performance/probability of detection. Designed for operational users of all abilities, the data is generated in real time and displayed using clear graphics. Correct interpretation of the graphs can provide Command information such as best evasion depth, likely target depths and optimum sonar position. The system is fully range-dependent and the embedded models have been independently verified. Available now to buy or lease on a weekly basis. The Annual Upgrade Plan is the support product for the WADER system. Contact Us for details. WADER training courses are available from OAD ranging from 1-3 weeks, depending on requirements. See Training or Contact Us for more details. WADER is designed to provide comprehensive capabilities within a user-friendly package. The system shields the new user from the complexities of underwater acoustic range prediction while simultaneously providing the experienced operator with advanced options to perform detailed calculations without significantly increasing the workload or complexity. The process is rapid, reliable and simple. It is controlled via four main screens (below). WADER applications include: research, training, teaching, EIA, operational sonar performance prediction, anti-submarine warfare (ASW), pre- & post-mission acoustic analysis. For additional uses, see the applications page. The Environment Screen (left) allows users to edit the track and operational environment. Users upload and manage their own (measured) environment profiles (salinity, SSP) from XBTs using time filters, edit the seabed properties and analyse the sound channel. The data is visualised using the seabed cross-section and profile charts. High resolution water column profiles can be merged automatically with the tack for use in the analysis screen. The Analysis Screen (right) is where the user conducts detailed propagation loss analysis. The screen has a probability of detection diagram, propagation loss graphic and ray-trace diagram. Users can also display an EIA chart, best source depth and intensity distribution chart. In-situ adjustments can be made for (among others) reverberation losses, target/source depths & sonar beam angle. Parameters for shipping, sea state and ambient noise are accounted for in the embedded FOM calculators. 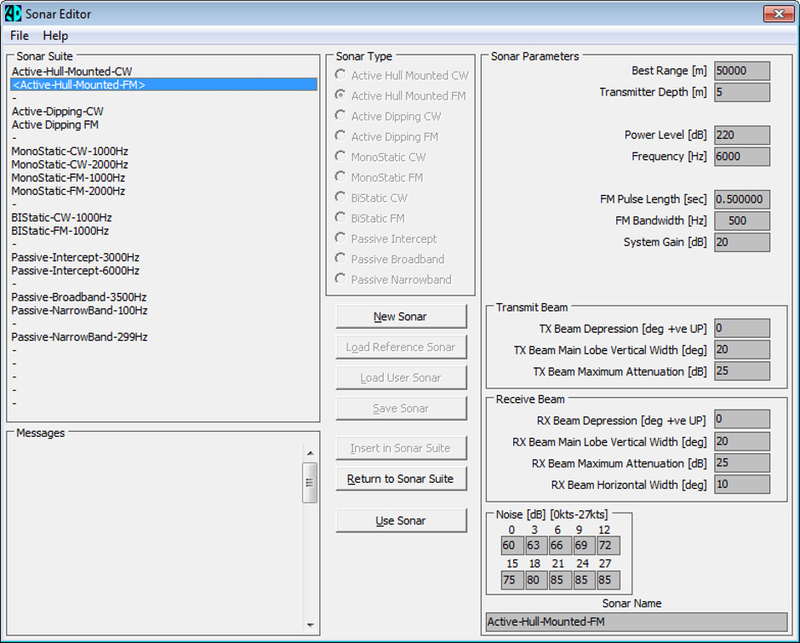 The sonar editor is where users add their own sonar parameters for use in their range prediction processes. WADER is supplied with a set of fictitious sonars – SPUTS – for training purposes. WADER has been developed over 20 years and the Graphical User Interface (GUI) is the result of OAD design effort and substantial feedback from informed users in the military and civilian research communities. With WADER there are no add-ons to purchase or hidden extras – every user has access to every feature of the program immediately. The product is regularly upgraded and upgrades are released as part of our Annual Upgrade Plan. A WADER brochure is available in English. This document contains additional information about WADER features, additional screen shots and data specifications. Please email us to receive a digital copy.